Watch out world! Cauliflower steaks are taking over the food scene. These hearty slabs of veg made their way on to the pages of Bon Appétit this month and everyone is intrigued. Sometimes, the best ideas are right in front of your face. If you love roasted cauliflower florets this recipe is for you. This version is marinated and served with pearl couscous medley. The medley is filled with raw vegetables, a great compliment to the tenderly roasted cauliflower steaks. Treat them like a hardy slab of beef: slice ‘em thick, slather with marinade, and roast on high to develop a sweetness only caramelization can impart. There might be a twinge of sadness when your family discovers the lack of meat on the plate, but the frowns will turn upside down at first bite. Serve with a steak knife and a smile. Cook couscous according to package directions. Set aside. De-stem the cauliflower with a paring knife being sure to keep the core intact. With the core side down, start from the center and slice 1” steaks. Finely chop and reserve the cauliflower pieces that broke loose. Whisk together grape seed oil, vinegar, tarragon, garlic, honey, parsley, red pepper flakes, and salt to taste. Place the steaks in a large heavy roasting pan. Using half of the dressing, generously slather both sides of the cauliflower steaks. Allow them to sit in the marinade for at least ten minutes. Transfer the cauliflower steaks to the oven; roast until tender and caramelized, about 30 minutes. In a large bowl, combine reserved cauliflower with the remaining dressing, roasted pepper, bell pepper, kalamata olives, couscous, and chickpeas. Allow the mixture to sit while the cauliflower steaks finishing roasting. To plate, top each cauliflower steak generously with the pearl couscous medley. I have seen these popping up on menus and have been very eager to try it, though I always end up ordering an actual steak, lol. I will have to make it at home!! Looks great. OMG, that's gorgeous! No meat needed. I love the different shapes and textures you've got in the dish with the chickpeas, pearl couscous and cauliflower. Oh, these are picture PERFECT! LOVE the twist you did with them...brilliant! Bravo! Thank you, Ann! I really want to try it they way you did it as well. I bet the tomato sauce is perfect for it. Nice and would love this try this for my family. Yes to cauliflower and hoping that if I do away with the couscous, it should be fine. Bookmarking for our meal at home and esp for me, that change I made to becoming a vegetarian means this is perfect meal. Wonderful! I look forward to hearing how you prepare it! 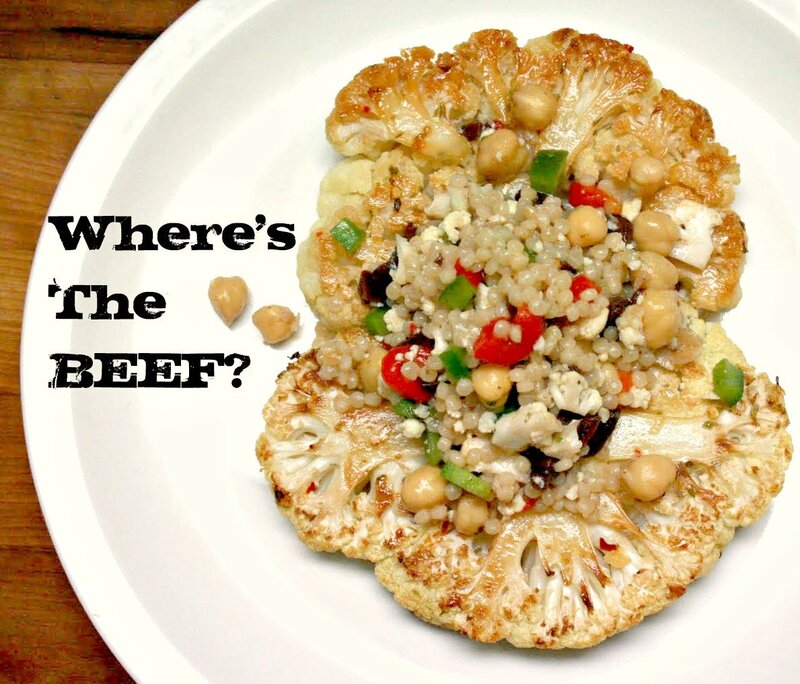 Second fabulous cauliflower steak recipe I've seen...I must try this method! YUM! Cauliflower is like brussel sprouts - so many people don't like it because they've openly ever had it cooked totally wrong. Steaming it just has no flavor, but it is SO good when cooked properly! I was never a fan of cauliflower until I roasted it. It is SO good roasted... and mashed like potatoes. mmmm. Cauliflower can be a bit of a loner and needs good friends like garlic, honey, herbs and heat to bring out the best in it. Lovely pics - almost as tempting as a fillet steak to an omnivore like me, and a great veggie alternative. Oh... I love this recipe! And I love the marinade for the cauliflower too. Healthy and super-delicious - Kudos! I saw the similar post at Ann's site and both of you made such a delicious meal!!!! 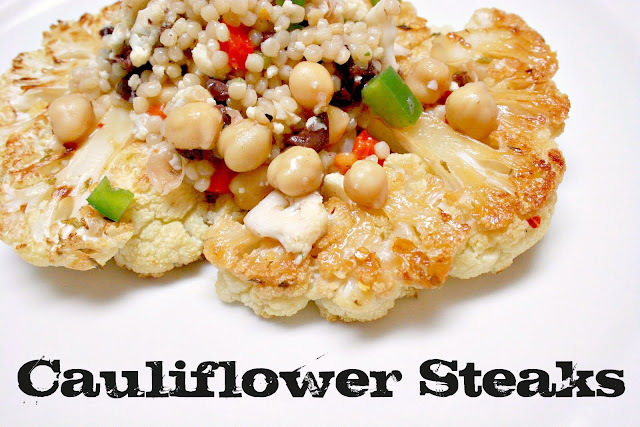 I love cauliflowers so I'm lucky to have two recipes of cauliflower steaks! Your presentation is stunning. No meat is necessary (even though I'm not vegetarian!). Yummy! I remember seeing this in that issue! Looks great! Bookmarking! This looks delicious. Such a gorgeous photo, too!